UPDATED: Humax launches TV Portal with iPlayer and Sky Player on set-top boxes | What Hi-Fi? Humax has today announced that its all-new internet TV Portal will be available on the Humax HDR-FOX T2 Freeview+ HD set-top boxes this weekend. An over-the-air download will run from Friday, February 4th to Sunday, February 6th. To access the TV Portal, users need to connect their HDR-FOX T2 to their home broadband network and press the 'TV Portal' button on the remote control. They can then search and view a range of free on-demand and live streaming content, with no set-up cost or subscription required. Sky Player is expected to launch on the TV Portal within a few weeks, at which time it will also be made available on Humax HD-FOX T2 set-top boxes. The new Humax TV Portal will bring BBC iPlayer, Sky Player, YouTube, Flickr, Wiki@TV, internet radio and more in to one central hub when it's launched on Humax Freeview HD set-top boxes next year. Due to go live in January 2011, the Humax TV Portal is in beta testing this month. A menu screen will allow direct access to catch-up TV services, online content from the likes of YouTube and Wikipedia, and more. 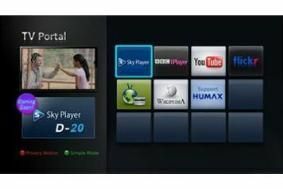 The new TV Portal will come to both Humax Freeview HD boxes, the HDR-FOX T2 and HD-FOX T2. More on-demand content, further catch-up TV services, plus shopping and social networking applications, are lined-up to follow in 2011. Certain boxes will also be able to access content over your home network – there's DLNA support – working as a client or a server depending on your home set-up and which box you have. Humax also suggests one box can stream to another, with the HDR-FOX T2 being capable of streaming to the HD-FOX T2. We look forward to getting a hands-on just as soon as it goes live.